A beginning reader with a silly story that may or may not hold up to interrogation about anthropomorphic animals and story logic. 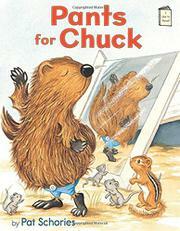 Big Chuck is a woodchuck who enjoys playing with other backyard animals such as a chipmunk, mice, a rabbit, a raccoon and a chickadee. They play, running and climbing about until Chuck spies a rag doll on the ground and inspects its clothing. He decides he wants the doll’s pants for himself and tries to squeeze into them. The others are obviously correct when they tell him that he is too big and the pants are too small, but Chuck ignores their protests and tries to run and climb about, just as before. Humorous watercolors capture the physical comedy of the scenes, and he remains determined to wear the pants until his girth makes them burst at the seams, with text reading “Pop! Rip!” Depending on readers’ suspension of disbelief, it’s either funny or confusing that on the next page Chuck covers his backside in embarrassment as the other animals look away. None of them is wearing clothing, and he was likewise Chuck-naked before donning the pants, so the internal logic of the story seems a bit off.